**This weekend was a great weekend. One of my best friends from junior high and high school came in town for a visit! She arrived Thursday evening and left Sunday after church. We kept her busy (and ate a lot!) and had a wonderful time! **Thursday evening Jason had a softball game, so Melissa and I had some girl time. She got settled in to our house, and we went to dinner at Udi's Bread Cafe. If you are in Denver, this is a great place for a light meal. We have been several times, and I often get the same thing, the "Big Apple Turkey" sandwich. It is turkey with slices of granny smith apple and brie on walnut cranberry bread. Yum! Of course, I would probably love anything with brie! **Friday, we had breakfast at Pete's Kitchen, a Denver landmark, where I had a breakfast burrito. I love those things! Pete's has been around since the 50's and is totally a greasy spoon diner but has character plus great food. After breakfast, we went to the new Titanic exhibit at the Museum of Nature and Science. It was opening day for the exhibit, so it was somewhat crowded, but I was really impressed with the exhibit. I learned a lot, but the best part was the focus on those who lost their lives. It really made things more real and made you think about the victims. We then spent a few minutes downtown and went consignment store shopping. Love it!We then went home and napped a little. Jason finally came home from work, and we had dinner at Salty Rita's, then rented "Music and Lyrics." **Saturday morning we tried a new restaurant near Coors Field called Snooze. We luckily arrived before the crowd hit and were seated promptly. It was great--the food was good, and I enjoyed the ambience. 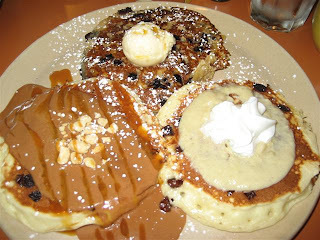 Below is a picture of my breakfast--a variety of yummy pancakes. From the top, clockwise: whole wheat blueberry, bostom cream pie and Snickers. I definitely will be going back! 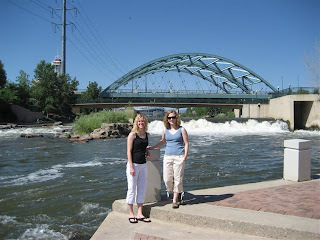 **After breakfast, we spent a few minutes at REI and by the Platte River (see first picture), and then went home and hung out for a while. It was nice just to spend some time at home relaxing. 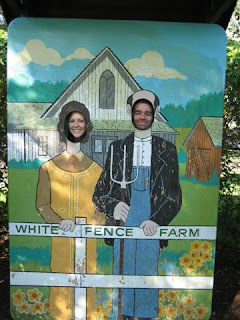 Late afternoon, we headed our for an early dinner at White Fence Farm. 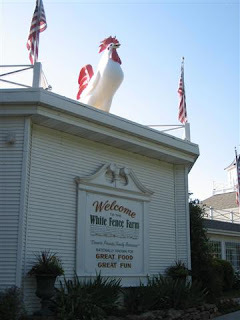 WFF is a country restaurant that serves food family style. There are several shops on-site, as well as a petting zoo and a big Clydesdale horse that pulls a carriage around the grounds. We had a fun time! **So that was our fun weekend. Melissa headed out right after church Sunday, and Jason and I spent the afternoon running errands and napping. 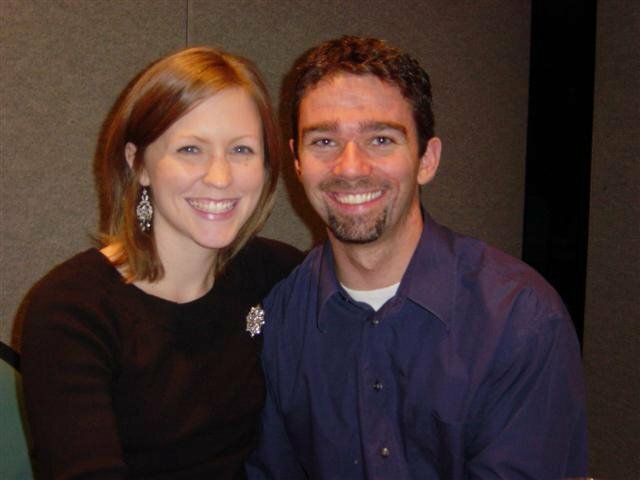 It was a great weekend, and it was such a blessing to spend time with Melissa. Yay for good friends! Thanks for visiting!! Snickers pancakes? Whoah. That is the most awesome idea ever. What a fun time! I hope to see you guys soon. Daisy & Oscar miss their grandmommy, I'm sure! Glad you had a great weekend. It sounded like a lot of fun. The pancakes look delicious. Yummy. That pancake plate looked amazing and that sandwich on the cranberry bread with the brie sounded TERRIFIC (minus the turkey of course). I bet having a friend come visit helps you see new things in your town.